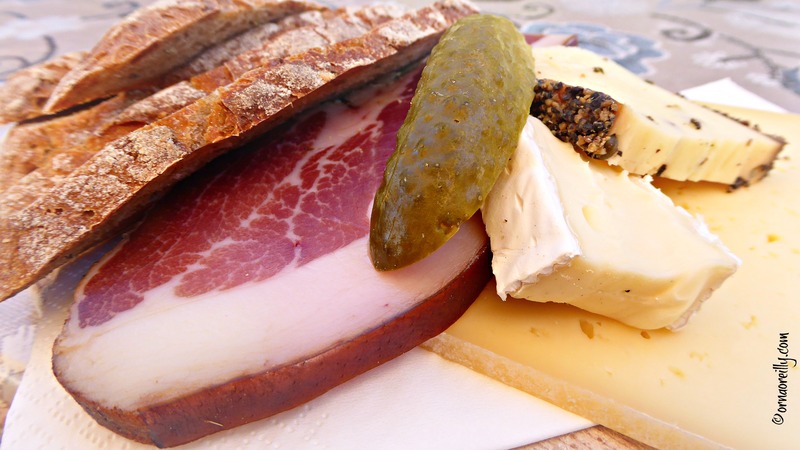 A plate of speck, with cheese, pickles and bread dotted with fennel seeds; when I think of food in the Dolomites this is what always springs to mind. 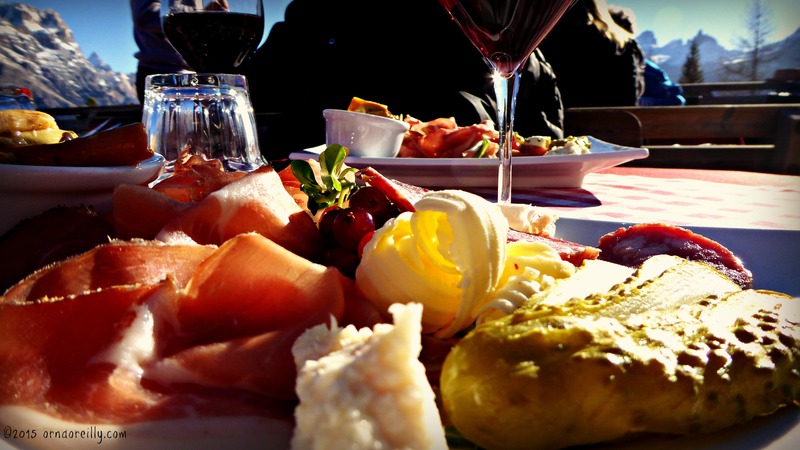 So when I visited this beautiful region of northern Italy recently, guess what I had for lunch on the very first day! 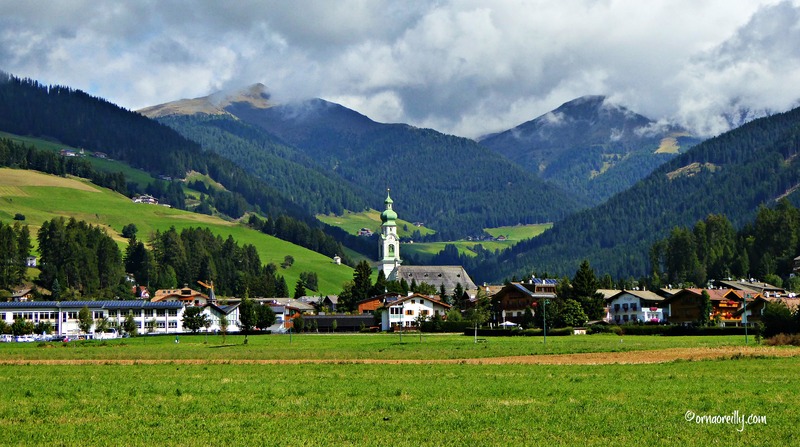 In September, I stayed in the Dolomites for a week, sampling the delights of the Val Pusteria in late summer. There were many activities on offer such as walking, cycling and hiking in the mountains. I was there with Tom Weber, The Palladian Traveler, and we were guests of Christian Pircher at the Hotel Adler in the pretty town of Villabassa. My previous visit to the Italian Dolomites had been during settimana bianca (white week) when I spent a snow-filled week with a group of skiers – in a non-skiing capacity – and had lots of fun whizzing up and down the mountains to various rifugi (mountain eateries) and walking in the snow. This time was to be different and it certainly was. 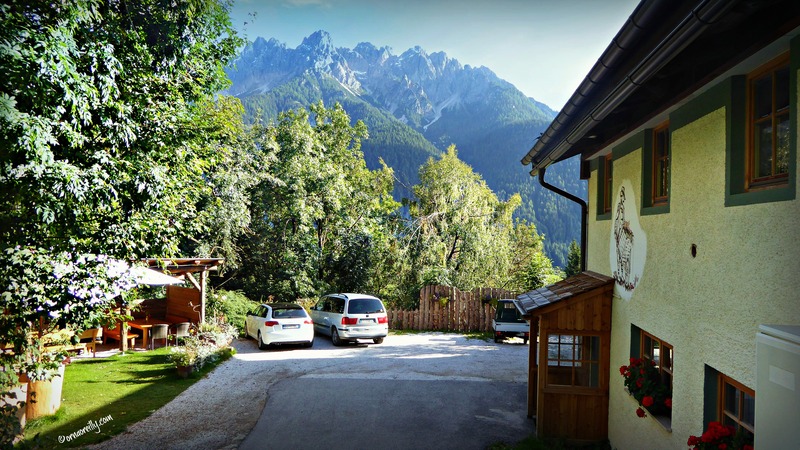 Having had a few extremely energetic days in a row, I was now keen to explore the delights of Tyrolean food and its origins. 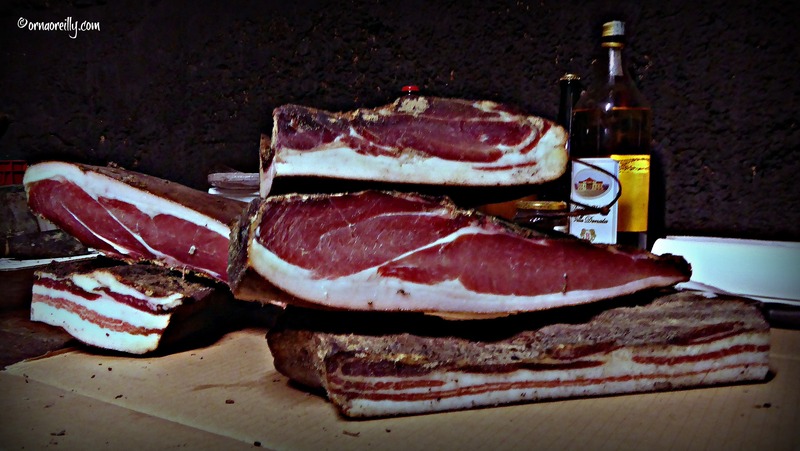 Christian suggested we visit a small artisan producer of speck who lives nearby. Off we went to Kugler Speckstube, which turned out to be a rustic B&B and restaurant in beautiful countryside just outside the town of Dobbiaco. 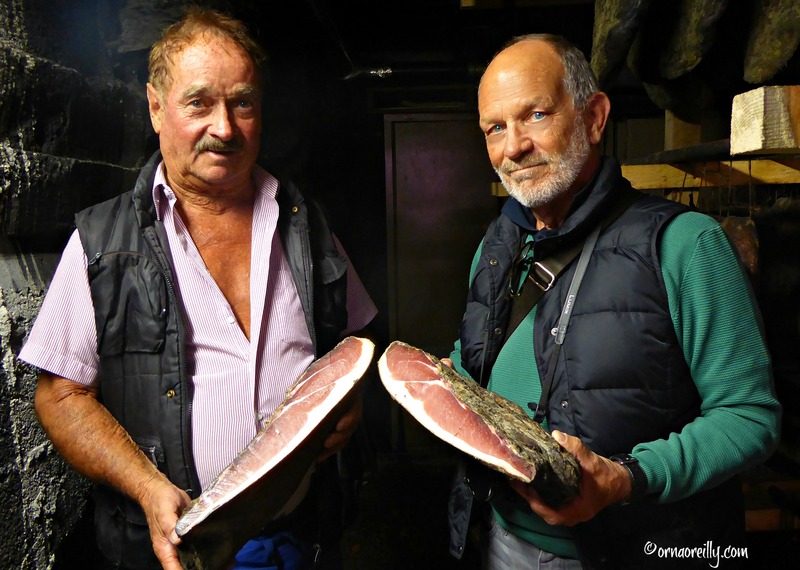 Here the owner’s father prepares the most delicious speck imaginable. Mostly this speck is used to feed the guests, but is also sold to the occasional droppers-in, like us. We met the man himself, Siegfreid Taschler, who invited us down into the depths of his dark, cool cavern. Speck hung in ghostly formation from hooks attached to iron bars stretching across the width of the basement. I pulled my jacket tightly around me and concentrated on what Siegfreid was telling us. For those who are unfamiliar with speck, it is a leg of ham that is smoked and cured. It is probably the most famous food of the Tyrol. Siegfried told us how he carefully chooses the pigs he wants to use to make his excellent speck. He flavours the meat with herbs and spices from his special – secret – list of ingredients, then cures and smokes it at controlled temperatures. He then hangs it to dry and these spookily hanging hams are the result of his labours. Bidding Siegfried a fond farewell and leaving with a lovely piece of speck under my arm, we headed for daylight. I hope you saved a bit of that freshly smoked speck for your friends. Gutten Appetit! A must when in the Dolomites. So much like Prosciutto while still totally different. Delicious! Your pen teases my brain of times past and memories made. I do have to return! Thank you.